HAM has opened a new gas station in Zaragoza, in the town of Alfajarín. Located in the El Saco Industrial Park, N-II kilometer 341, it occupies a strategic point within the national geography for the refueling of vehicles that make a route between Madrid and France, passing through Guadalajara, Zaragoza, Lleida, Barcelona and Girona. This service station, easily accessible, with shop and coffee shop; It has a double liquefied natural gas (LNG) pump for trucks and a double compressed natural gas (CNG) pump for trucks and light vehicles. The innovative dual-fuel system of LNG and CNG, designed and manufactured by HAM, allows refueling two LNG and LNG vehicles in a single pump. The gas station in Alfajarín joins the 22 stations currently operated by HAM, confirming our commitment to the environment, betting on promoting LNG and CNG as an alternative, clean and sustainable fuel, which reduces nitrogen oxide emissions and It eliminates fine particles and sulfur oxides, improving the quality of the air we breathe and reducing the negative impact on the environment. In addition, the use of natural gas is cheaper and saves between 30-50% compared to the use of fossil fuels derived from oil. In Ham Group we were pioneers in building the first LNG station in the Peninsula and we are currently the company with the most experience in Europe in the vehicular LNG sector and who commercialize a greater volume of liquefied natural gas for vehicular use. We have become a reference for other companies in the sector, betting on compressed natural gas and liquefied natural gas as an alternative to gasoline and diesel. 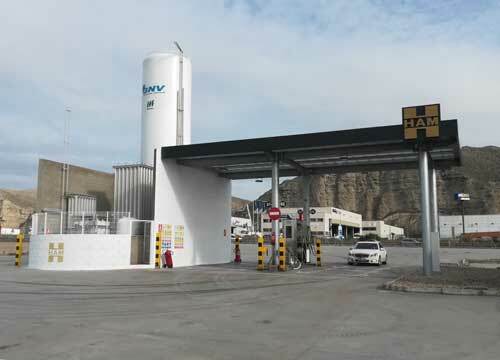 HAM continues working to expand and strengthen the structure of current service stations, with the intention of continuing to open new LNG and CNG refueling points in the main cities of Spain.